Ace Frehley’s covers album, “Origins Vol 1.”, has debuted in the US Top 25. The project enters the US Billboard 200 at No. 23 with opening week sales of 16,109 equivalent album units. The record also lands at No. 1 on the Billboard Hard Music chart, No. 3 on the Billboard Rock chart and No. 6 on the Billboard Current chart. Frehley’s last album, 2009’s “Space Invader”, debuted at No. 9 on the Billboard 200. 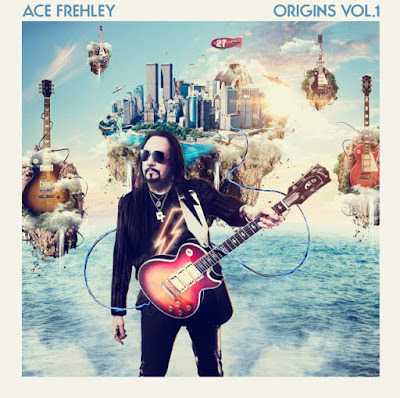 “Origins Vol 1.” Sees Frehley deliver new versions of tracks by Led Zeppelin, the Rolling Stones, Cream and Jimi Hendrix, among others, along with guests including Paul Stanley, Slash, Mike McCready of Pearl Jam, Lita Ford and John 5.
and Thin Lizzy’s 1976 track, “Emerald”, which features Slash. Frehley recently issued a third track, a cover of Free’s “Fire And Water” with guest and former bandmate Paul Stanley. This week, the guitarist will release a video for the song – featuring Stanley – in sync with Frehley’s 65th birthday. Frehley has fully recovered, saying, "I'd like to thank the great doctors and nurses at Wilkes-Barre General Hospital!"